WARSAW, Poland (AP) — Two of Poland’s most famous foes, former President Lech Walesa, and the country’s de facto leader, Jaroslaw Kaczynski, faced off in court Thursday, exchanging wry comments. Kaczynski, the powerful head of the ruling Law and Justice party, is suing Walesa for blaming him in social media posts for the 2010 plane crash in Smolensk, Russia, that killed Kaczynski’s twin, then-President Lech Kaczynski, along with 95 others including top Polish political and military leaders. In one 2016 post, Walesa alleged that Kaczynski, “guided by bravado,” was on the phone pushing for the plane to land in heavy fog. It’s an allegation sometimes made by Kaczynski’s critics, but no evidence has ever emerged to prove it. Kaczynski wants Walesa to admit his words were untrue and that he be forced to pay 30,000 zlotys ($8,000) to charity. Kaczynski, 69, and his twin, who was a top Solidarity activist, promoted Walesa to be democratic Poland’s first popularly chosen president in 1990. They became his closest aides, but soon bitterly fell out with him in still unclear circumstances. Walesa has claimed that the brothers wanted control over him. The Kaczynskis alleged he had been a communist collaborator codenamed “Bolek,” which Walesa denies and says documents suggesting that were forged. 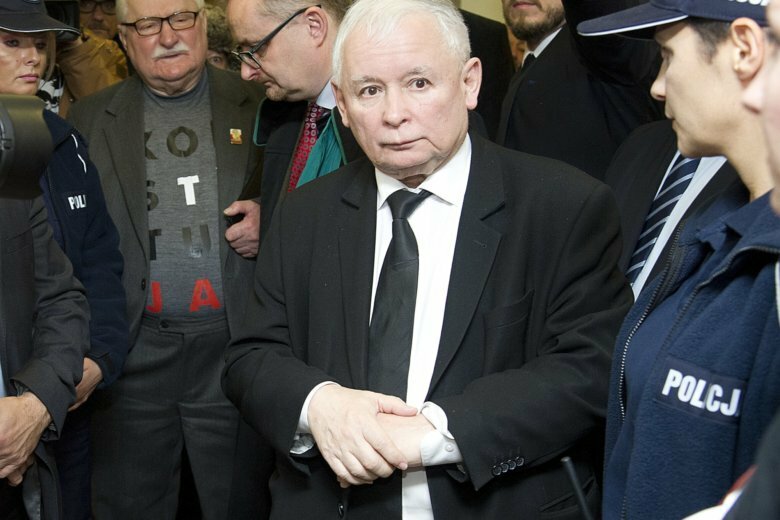 Kaczynski insists that Poland’s transformation to democracy was imperfect and left a lot of political and financial influence in the hands of the former communist rulers. Outside the courtroom in Walesa’s hometown, the Baltic port city of Gdansk, the former allies-turned foes sparred verbally. “Why did I ever make you my minister?” Walesa asked Kaczynski as they stood together before entering the courtroom, calling him “my great mistake. Today, Walesa is a bitter critic of the government that Kaczynski guides from behind the scenes, accusing it of eroding the democracy he helped bring to life. He arrived in court wearing a T-shirt with the word “Konstytucja” (Constitution), which has been a rallying cry of the anti-government opposition. Kaczynski was dressed in a black suit and tie, the attire he has always worn publicly since his brother perished. Despite the court’s encouragement, they failed to reach an agreement, so more court sessions will be held.